The beauty and serenity of Montana, that abound at Grand View Campground, is enough to make anyone want to visit time and time again. 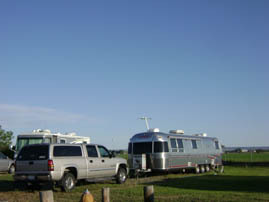 Coupled with our top of the line facilities and the features we offer, our Hardin, Montana campground is sure to please. We offer extra wide, pull-thru sites (25’x120’+) or large, back-in sites along with dry camp and tenting sites (in case you’re without a rig). All of our sites are pet friendly, so feel free to bring Fido (or Fifi) along on your visit! While staying with us, you can enjoy fresh city water and sewer hookups. Our shaded picnic areas and on-site, handicap-accessible restrooms are never far away, and we offer FREE 52 channel, cable TV access as well. If you’re in need of laundry facilities, you can take advantage of our full laundromat facilities 24 hours a day!